The year 1918 was a good one for culture: it gave us Leonard Bernstein, honored with an exhibit at the Lincoln Center Library for the Performing Arts earlier this year, and also Jerome Robbins, born October 11th of that year, the current subject of such an exhibit, and the namesake of southern border of Lincoln Center Plaza, 62nd Street. Last spring, the library celebrated Robbins's centennial with "Robbins At Night," projecting images of Robbins and his work on the ground just outside its front door from 7pm to 1am, images that sparkled not just with Robbins's creativity but with the reflective specks embedded in the ground of the plaza. A beautifully poetic tribute, but not as engaging or immersive as the current exhibit of artifacts related to the man who created such diverse pieces as "Fancy Free," a ballet about World War II sailors, and the "Bottle Dance," from "Fiddler on the Roof," inspired by a man goofing around while balancing a bottle on his head at an Orthodox Jewish wedding Robbins attended. There is a lot to capture the imagination in curator Julia Foulkes's exhibit. Visitors to "Voice of My City: Jerome Robbins and New York" are greeted by Robbins's reflections on the city that he loved, both his handwritten thoughts under glass and those same thoughts, reformatted to look like a stylized poem, enlarged on the wall, accompanying a picture of a young Robbins. Thoughts like, "My city lies between two rivers" and "My city is a lone man walking" offer a window into how Robbins felt about his home town. Some of these passages are scattered throughout the gallery, accompanying appropriate images. One of the most striking is "my city is cut + recut + slashed," which appears across a photograph Robbins took of a building he had once lived in, while it was in the process of being razed to make room for a high rise. Another, "my city fighting + hitting + hurt," accompanies a display devoted to how Robbins, a gay man, worked to combat the devastation of HIV/AIDS when it began to tear through New York City. His passion for NYC is central to the exhibit. A tribute to a dancer and choreographer cannot properly be done without video elements, and there are plenty of those, including footage he took of people in Central Park, for research and inspiration, and side by side recordings of one of the solos in "Fancy Free," with Robbins dancing the solo in the video of the original production and Christopher d'Amboise doing the same in a video from 1981, paired to show how the dance both evolved and stayed the same over time. Costume pieces from the original and current productions of "Fancy Free" can be seen, as well. The gallery also has some visual art on the walls, both by Robbins himself and by an artist who inspired some of his work, Paul Cadmus, whose 1934 painting "Fleet's In!" is displayed next to a sailor suit from the New York City Ballet. One very fun piece features audio clips recorded, for twenty-five cents, at a 1940s Times Square Voice-o-Graph booth, by Robbins and his friend and collaborator Nancy Walker. At one point, Robbins can be heard giggling while trying to sing along with Walker. Then there's the musical theatre stuff, which drew me to the exhibit in the first place. 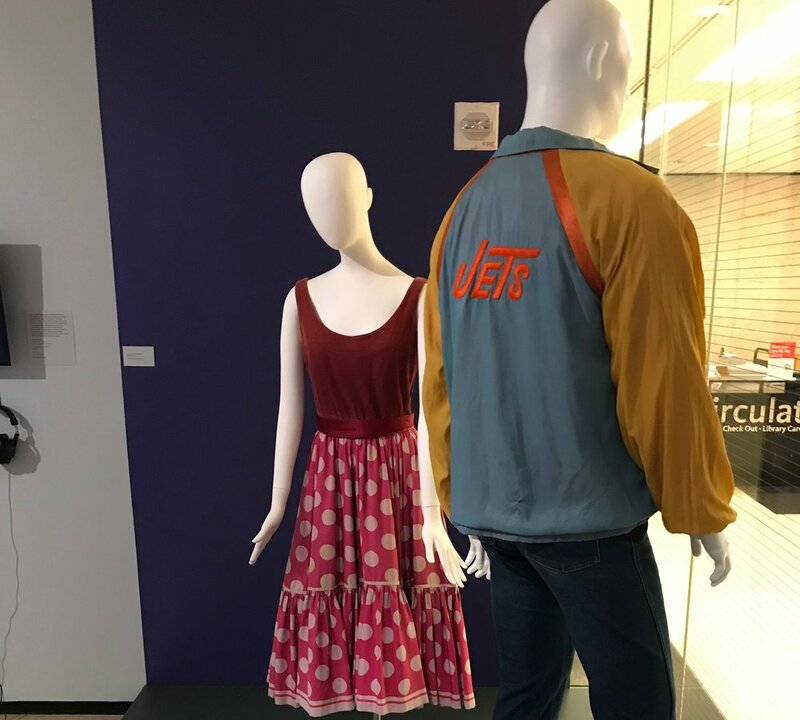 "West Side Story" and "Fiddler on the Roof" are well represented, with things like costumes for "Jet Man" and "Shark Woman," filled out by mannequins, and a documentary about a production of "Fiddler on the Roof" that featured a cast of black and Hispanic preteens, and the impact it had on their community. As always at these exhibits, there are interviews that can be listened to with headphones, as well as a display of Robbins's accolades, most prominently an Oscar and a Key to the City (which goes perfectly with the overall theme) that was presented to him alongside Leonard Bernstein and Arthur Laurents (who wrote the book for "West Side Story" and will hopefully get his own exhibit at the library one day). In one semi-hidden corner is a vibrant display devoted to Robbins's diaries, which were not what we in the western world would usually think of as diaries, but Japanese accordion diaries, which Robbins preferred to use during his intense self-reflection in the 1970s. "Voice of My City" is packed with such fascinating details, but also open and spacious, making even the least dance-savvy person (like me) almost feel that I could take inspiration right from the Robbins-themed surroundings and express myself through movement. I wouldn't recommend dancing through the gallery, but a visit should be on the to-do list of anyone passionate about the performing arts. Aaron Netsky (@AaronNetsky on Twitter) is a singer, writer, actor, and all-around theatre professional who has worked off and off-off Broadway and had writing published on AtlasObscura.com, TheHumanist.com, Slate.com, StageLightMagazine.com, and ThoughtCatalog.com, as well as his own blogs, Cantonaut (http://cantonaut.blogspot.com) and 366 Musicals (https://366days366musicals.tumblr.com), and his Medium account. He is currently the Production Assistant at the off-Broadway revival of Tennessee Williams's "A Lovely Sunday for Creve Coeur" at the Theatre at St. Clements.